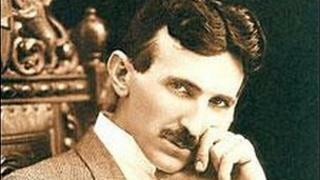 Tesla was born in present-day Croatia in 1856, and graduated from university in Graz, Austria. In 1884, he started working for the inventor Thomas Edison, already famous at the time, on transmitting electricity. But the two scientists soon began to disagree about the fundamental aspects of their work, in what became known as the "war of currents". They eventually fell out and went their separate ways. Edison worked with direct current (DC) - the kind produced by batteries, where electrons flow from negative to positive terminals. But Tesla advocated alternating current (AC), where the current periodically changes direction. Although the first commercial electric-power transmission, built by Edison, used DC, it is AC that now powers most households around the world. Tesla was known as an eccentric character, nicknamed the "wild man of electronics". Trying to prove the safety of his AC lighting system, he would light lamps in his hands by using his own body as an electrical conductor. Tesla was certain he could develop enough power to "split the earth like an apple". During one of his experiments in Knob Hill, Colorado, he blacked out the entire city of Colorado Springs. Once, he wirelessly lit 200 lamps from a distance of 40km (25 miles). Despite hundreds of inventions and some of the most important scientific breakthroughs, Tesla died heavily in debt in 1943.